Skipper Grant Leadbitter reckons Middlesbrough must become ruthless up front to keep alive their Championship promotion ambitions. Boro slipped six points adrift of the play-off places following Saturday’s disappointing 1-0 defeat at Norwich. The Teessiders paid a heavy price for Rudy Gestede’s 28th-minute sending off, with the Canaries capitalising to secure all three points with German midfielder Tom Trybull’s low shot into the bottom corner right on half-time. Ex-Sunderland midfielder Leadbitter told mfc.co.uk: “We created chances and we were set up and that’s been it for the last few weeks. “We have to take our chances when they come because we’re letting teams off the hook and we let Norwich off the hook today in the first 25 minutes,” said Leadbitter. “After the sending off, the boys dug in well for each other and it just didn’t go for us. “Early doors, we were the better team, there’s no doubt about that. “We had some good chances, we started the game well like we have done for the last three or four weeks since the manager’s come in. And Leadbitter said: “The sending off has killed the game and they got a goal just before half-time that we’re really disappointed with. Boss Pulis was furious at the red-card decision, saying: “I have seen challenges in the Premier League this week that were 10 times worse than that and the players haven’t been sent off. “I am very disappointed about what was a game-changing decision by the referee. I thought it was a good game until the sending off, but I don’t want to focus too much on that. “We created two good chances before the red card and one good one after it but we didn’t take them and that is very disappointing. The only goal of the match came moments before the break as the Canaries finally got their noses in front in a game which had been an even contest until the flashpoint. Norwich: Gunn, Hanley, Zimmermann, Klose, Reed, Tettey, Trybull (Leitner 60), Lewis, Maddison (Vrancic 72), Oliveira, Murphy (Hernandez 86). Subs not used: Watkins, Stiepermann, Srbeny, McGovern. Booked: Trybull, Tettey.Goal: Trybull 44. 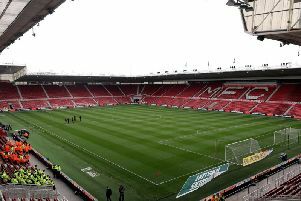 Middlesbrough: Randolph, Shotton, Ayala, Gibson, Friend, Clayton (Assombalonga 82), Leadbitter, Downing, Traore, Gestede, Bamford (Howson 63). Subs not used: Konstantopoulos, Cranie, Fry, Harrison, Besic. Sent Off: Gestede (28). Booked: Gestede, Leadbitter. Att: 25,960. Ref: Michael Jones (Chester). “ Boro yesterday appointed former defender Curtis Fleming as first-team coach under Tony Pulis. The 49-year-old, who made more than 300 appearances for Boro from 1991-2001, has left a similar his role as assistant manager under Ian Holloway at Championship rivals QPR. Fleming was assistant under Craig Hignett during his short stint as Hartlepool United manager.